You may think that eggs are good for you but just one averaged sized chicken egg contains almost the maximum daily amount of cholesterol. Not only that, but there is more harmful bacteria in eggs than any other edible food. So if you think that a breakfast of scrambled eggs on toast is a healthy way to start your day read on to find out why it's time to rethink some of the facts you thought you knew about the food on your plate. Eggs are basically the equivalent of chicken periods, or chicken "menstruation". They're unfertilized chicken ovum, and that's why they're so full of cholesterol: they're actually made of steroid hormones (which are made from cholesterol) that, when fertilized, will produce and grow a baby chick. About 70 percent of the calories in eggs are from fat, and a big portion of that fat, contained in the yolk, is saturated. Another health concern is the fact that because egg shells are fragile and porous and conditions on egg farms are crowded, eggs are the perfect host to salmonella enteritidis - a bacteria that is the leading cause of food poisoning in the United States and several European countries. Salmonella can be inside perfectly normal-appearing eggs, and if the eggs are eaten raw or undercooked, the bacterium causes illness. If you still want to eat eggs think about this. Chickens are fed on cheap food - a low-grade diet, often genetically modified (GM) to aid them with their growth. This feed contains drugs, hormones, antibiotics and pesticides which is digested by the chicken and then passed through to her egg... which means all those very same toxic substances are being consumed by the person who chooses to eat that egg. Furthermore, eggs are acidic which means that consumption of them contributes to all the illnesses like heart disease, cancer etc. that we discussed in the meat section. And more recently, research has shown that eating eggs can also inhibit the absorption of iron, which is needed for healthy blood, cells and nerves. And due to the fact that eggs contain saturated animal fats they will contribute to a loss of calcium and therefore increase the risk of developing osteoporosis, just as eating meat does. In the Physicians' Health Study I, which included 21,327 participants with an average 20 year follow-up, researchers found that those who consumed seven or more eggs per week had an almost 25 percent increased risk of death than those with the lowest egg consumption. For participants with diabetes, the risk of death was twofold compared to those who consumed the least amount of eggs. Cholesterol intake is positively correlated to an increased risk of coronary heart disease. One large egg contains approximately 215 mg of cholesterol. The American Heart Association advises eating less than 300 mg per day, and less than 200 mg for those with heart disease. There is no biological requirement for dietary cholesterol. Drug and pesticide residues in eggs are a human food safety concern. 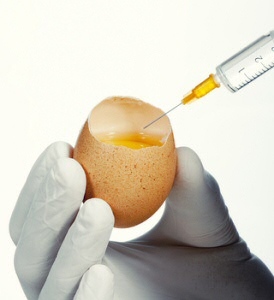 Nutritionally, eggs are far from the wonder food the industry would have you believe. Like all animal products, they have no fiber at all and are acidic. 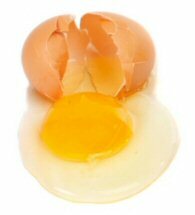 Egg whites are high in animal protein, the type of protein that, when eaten in a large quantity, can be harmful to the kidneys and can contribute to calcium losses and egg yolks are high in fat and cholesterol. So, if you care about your body, let your eating habits evolve and remove eggs from your diet today! Dr. Michael Klaper, Nutrition for Optimum Health.